Hello Friends! I’m back from the woods and had the best weekend relaxing and soaking up some nature! Although I know that ya’ll are excited to hear about my camping trip, I’m sure you have also been looking forward to this recipe after I’ve been teasing you with it all week! 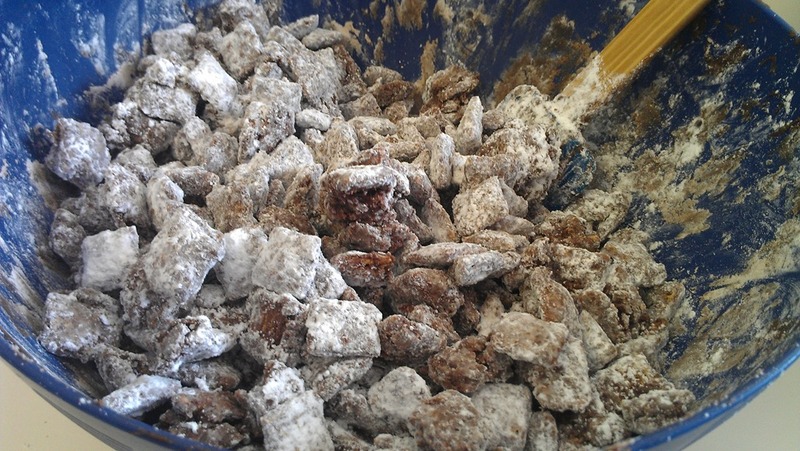 I made two attempts at Nutella Puppy Chow last weekend. Both turned out addictingly good, but this recipe had a little bit of a stronger Nutella flavor. Bonus! Puppy Chow is always a crowd favorite, and this recipe won’t disappoint! I recommend my favorite freezer storage method to keep things fresh and because I love that first chilled bite! But be warned…no matter where you store it, this Puppy Chow won’t last long! What is your favorite variation? Pour Chex cereal into large bowl. In a separate microwave-safe bowl, combine peanut butter, Nutella, and butter. Microwave for ~2 minutes in 30 second intervals, stirring until smooth. Do not overheat. Stir in vanilla. Pour Nutella mixture over Chex using a spatula to spread evenly over cereal. Stir in powered sugar 1 cup at a time until well coated. Nutella + PB in puppy chow = amazing! Thanks Leslie! Hope you enjoy! Oh my- this looks amazing! Nutella is my biggest weakness. I’m going to have to try this after my big race! I’m glad you enjoyed your weekend in the woods! It will be perfect for post race snacking and enjoyment! Nutella can do some many cool things, but I agree it is dangerous to have in the house! I’m glad you’re back safe and had a great time! WOOF this puppy chow looks GOOD! OH my gosh, I love nutella! get in my belly!! He he! Hope you find some time to make your own batch (or I’ll send some your way next time). That is a great idea! If I had a downstairs then I would feel better about walking up and down the stairs to get each handful…ha ha! Try it and then let me know what you think! Yes!!! Do they have Eurocream too? I keep seeing it at the grocery store! O.M.G. I had to read this post when I saw the title. I LOVE Nutella and had never thought about making puppy chow with it. So easy and so yummy! Definitely going to give this a try. Thanks for sharing!